NorthLink Ferries’ iconic Viking, Magnus, was brought to life today (Tuesday, 27 January) during celebrations at Shetland’s world-renowned fire festival Up Helly Aa. 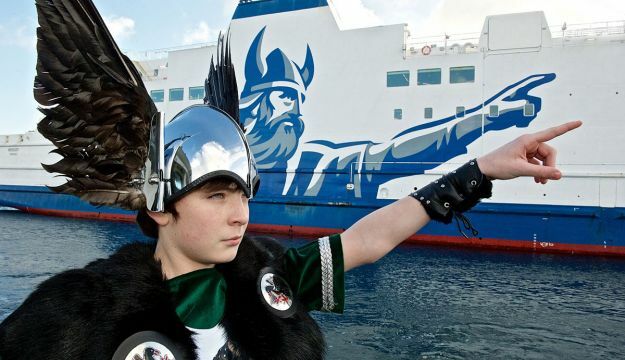 Acting as King Magnus the Good, 13-year-old Lewis Harkness led 15 members of the Junior Jarl Squad on board the MV Hjaltland followed by over 100 members of family and friends to enjoy a lunch hosted by NorthLink Ferries. Marking the occasion, a Viking shield was presented by Lewis to Captain Dave Wheeler on board the vessel and a message of thanks given to those who helped design and make the array of costumes.